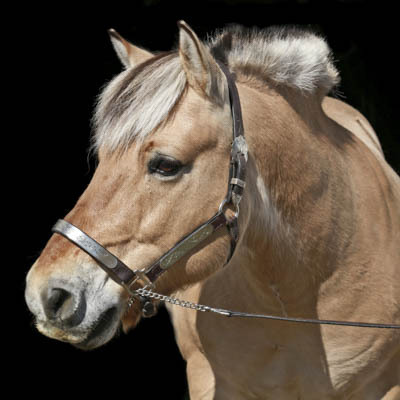 Encana is a Brown Dun Norwegian Fjord Gelding, and he stands at 13.1HH. Encana was born in 1998. Encana started service in 2002, and his purchase was made possible thanks to a generous donation from Encana Corporation. Before starting work at PARDS, Encana was a pack horse. Encana was trained to be ridden right here at PARDS. Encana’s spiky mane, fuzzy coat and soft velvety nose can stimulate a client’s tactile senses. His rhythmic motion and fun, bouncy trot causes riders to focus on his movement. This can have a particularly calming effect on clients with autism. Encana is famous around the barn for his ‘smile.’ If you come for a visit and give his nose a gentle tickle, he may respond with his big toothy grin!